This wide-ranging volume covers recent developments in the theoretical understanding of the chemistry and physics of chemical vapour deposition (CVD). Contributors are drawn from both academia and industry to achieve a balaced coverage of the subject. The volume emphasizes principles and understanding rather than details of specific materials or processes. Specific examples are given to illustrate the principles. Postgraduates, researchers, and practitioners in the fields of solid state physics and chemistry, microelectronics, materials science, optics, and electronic engineering. M.L. Hitchman and K.F. Jensen, Chemical Vapour Deposition--An Overview. K.F. 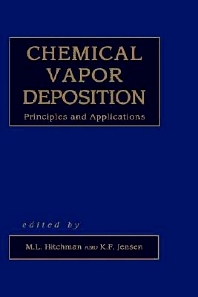 Jensen, Fundamentals of Chemical Vapour Deposition. W.G. Breiland and P. Ho, Analysis of Chemical Vapor Deposition Processes. M.L. Hitchman and K.F. Jensen, Chemical Vapor Deposition at Low Pressures. B.S. Meyerson, Silicon Epitaxy by Chemical Vapor Deposition. R.L. Moon and Y.-M. Houng, Organometallic Vapor Phase Epitaxy of III-V Materials. D.W. Hess and D.B. Graves, Plasma-Assisted Chemical and Vapor Deposition. V.R. McCrary and V.M. Donnelly, Photo-Assisted Chemical Vapor Deposition. W.B. Jackson, Electronic and Optical Characterization of Chemical Vapor Deposition Films for Device Applications. G. Wahl, Protective Coatings. Index.